I’ve dated a lot of narcissists and didn’t realize it until I learned that my father was a narcissist. I didn’t think of my father as a narcissist until a family friend referred to him as such after returning from a game of racquetball. I vividly recall the peculiar smirk my father displayed in response to this assertion, and from this point forward I began considering my father through a lens of narcissism. Doing so helped me better understand both him and my unhealthy relationships — I don’t feel loved by my father, and was seeking love from people who felt similar to him, but because this similarity was based in narcissism I instead kept being abused. It has taken me a long time to understand the impact narcissistic abuse has had on my life, and I am in the midst of confronting some of the deeper wounds this abuse has inflicted upon my psyche. I want to share what I have learned about narcissism and narcissistic abuse with the hope that doing so can help others learn how to understand narcissism and how to navigate relationships with narcissists. Narcissists are not bad people; they are hurt people, and hurt people hurt people. What makes narcissism difficult to deal with is the fact that narcissists do not consider themselves to be narcissists, and will react with anger if any of their narcissistic qualities are identified. You deserve to have your needs met in every relationship, but if you are in a relationship with a narcissist then it is likely that your needs are not being met and that you are in pain that you might not realize you are in. My aim is to thus provide an overview of what narcissism involves and how narcissism harms others, followed by suggestions about how to heal from narcissistic abuse. The term narcissism comes from the story of Narcissus, a beautiful male youth in Greek myth who fell in love with his reflection. Ovid’s Metamorphoses is a primary source for this story, which I will briefly summarize with a few modifications. Narcissus’s image was reflected in a pool of water, and he was so captivated by it that he could not turn away from it. So devout was his self-admiration that he began to say “I love you” to himself, which was heard by Echo, a beautiful nymph condemned to only be able to repeat what others say. “Love you,” echoed Echo, which Narcissus interpreted as further evidence of his attractiveness. This deepened Narcissus’s attraction to himself, and inadvertently misled Echo into thinking that he loved her back when in reality his love was only a reflection of love for himself. Narcissus eventually became so invested in his image that he touched the pool of water in which he was reflected, and in doing so met his demise by drowning. Narcissus was thus claimed by his image, and lost his life because of it. The narcissus flower is named after him, and in the story it emerged from the soil where Narcissus died. 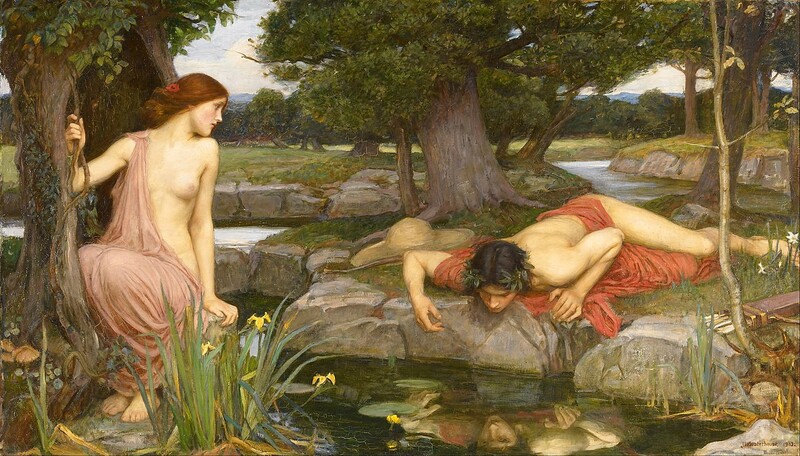 I think the story of Narcissus is a useful allegory for understanding how narcissism develops and is maintained. The role of Echo in this story is also useful because it allegorizes the kinds of personalities who tend to be attracted to narcissists. I will say more about this later, but wanted to begin with this story to figuratively frame the psychological phenomena that underlie narcissism. Narcissism can be understood as an attachment disorder that develops during early childhood as a result of lacking safety and consistency in parental caretaking. The child who develops narcissism learns early on that their environment is unsafe and that they cannot depend on their parents for support, and copes with this situation by developing a steadfast attachment to themselves. “I cannot depend on you, so I will therefore only depend on myself,” are words a child in this kind of situation might use to describe their experience, but when it comes to narcissism (and most other personality disorders), the experience occurs before language has been acquired. The fact that narcissism develops so early in childhood before language acquisition is a primary reason why narcissistic traits remain unconscious to narcissists, and is also how narcissistic behavioral patterns become habitually engrained into the workings of the narcisisst’s psyche. A psychoanalytic aspect of narcissism regards a repressed feeling of inadequacy that is covered up by the behaviors associated with narcissism. From this perspective the narcissist’s behaviors can be thought of as types of compensation for fundamental feelings of vulnerability and inadequacy that are repeatedly covered up by the narcissistic personality. This is the emotional seed out of which narcissism develops, for the abused and abandoned child initially feels scared and angry in relation to how they are treated by their parents, but does not heal from the trauma of this experience and instead tries coping with these feelings by developing and maintaining a narcissistic attachment to themselves. I would like to elaborate upon a few of these criteria with more detail and some examples. I am exceptional, no exceptions. This circular reasoning is the analytic repetition that maintains the narcissistic personality. It is like a recursive algorithm that refers to itself through a lens of exceptionality. I find that many narcissistic deflections utilize this kind of logic, and that most narcissistic qualities are based in a belief in the truth of this maxim. Narcissistic supply is a term to describe the steady stream of attention upon which narcissists depend to maintain their sense of grandiosity. A sense of grandiosity cannot be fully maintained on one’s own; one needs proof of their grandiosity, and for the narcissist a lot of this proof comes from the admiration of others. The narcissist therefore needs to be admired, and will go through great lengths to receive and maintain this admiration. Without this kind of feedback the narcissist cannot be sure of how great they are, and therefore come to depend upon constant admiration from others in order to maintain their perfected image. The narcissist cares a lot about coming across positively to others, and will experience significant amounts of distress upon receiving negative feedback from others. Narcissistic rage refers to the reactions narcissists have when their supply of positive attention is threatened or cut off. This rage is based in the threat of having their repressed vulnerabilities exposed, and often results in abusive behaviors that aim to punish dissenters into submission. Narcissistic rage can thus be thought of as a defense mechanism that aims to maintain the perfected serenity of the narcissist’s self-image. This is probably how Narcissus would have reacted if someone threw a rock in the pool of water that reflected him, distorting his image and threatening the stability of its idealization. When enraged (or, triggered) narcissists will do anything within their power to reclaim their supply of positive attention. This is where lacking empathy becomes relevant to narcissistic pathology, for the narcissist does not genuinely care about anyone other than themselves. Other people are objects to the narcissist who are used to maintain the narcissist’s sense of grandiosity. Threatening the narcissist’s sense of grandiosity will likely result in either removal from their world (e.g., breaking up with you, being fired), or abuse if you cannot be removed from their world (e.g., if you are their spouse or family member). Given that narcissists depend upon constant admiration from others and experience rage when this admiration is disrupted, it is important that narcissists surround themselves with the kinds of people who will steadfastly admire them without questioning them or challenging their behaviors. This is why narcissists tend to be attracted to empaths, for empaths tend to listen well and take genuine interest in the lives of others. The empath is like Echo in the story of Narcissus who repeats back everything Narcissus says. Echo was cursed to only be able to repeat back what she hears others say, and what she hears from Narcissus sounds like love that she mistakenly assumes is directed toward her. Narcissists need people like Echo to reflect back the love they proclaim for themselves, but ultimately do not love anyone but themselves because of the traumas of early childhood abuse and neglect that undergird their personality. Empaths with low self-esteem can be easily misled by narcissists because they appear to embody the kind of confidence the insecure empath desires but ultimately does not have. Empaths need to be careful to not blindly surrender themselves to others, and to be aware that narcissists are drawn to and exploit empaths for the quality of the careful attention they provide. This leads into what makes relationships with narcissists so unhealthy and potentially damaging. What is it like to be in a relationship with a narcissist? The narcissist needs continuous positive attention from others, but also cannot let anyone get too close to them because doing so would threaten their ego attachment and sense of independence from others. This is why narcissists strategically provide and withdraw attention from their suppliers in order to keep them in a perpetual state of reaching for attention. This hot-and-cold dance of deviation is what keeps people trapped in the world of the narcissist, and is how narcissists secure their precious supply of attention. The narcissist will only attend to you when they feel that you are leaving so that you come running back into their world. This is what can make leaving a relationship with a narcissist so difficult, because it is easy to be misled into thinking that the narcissist actually cares about you when they demonstrate acts of care — especially if you are deprived of acts of care in the relationship. The narcissist seems to have some awareness that their behaviors are harmful and/or unacceptable, but cannot consciously admit this, and therefore use any means necessary to manipulate others into perceiving them as a perfect person (i.e., exceptional, no exceptions). This is the context wherein a narcissist might demonstrate some modicum of care toward their suppliers, but don’t be fooled — these are surface-level attempts to convince you of their integrity, and have nothing to do with any actual care they have for you as a person. Gestures like these might indeed come from a place of goodwill, but their function is based primarily in keeping you around and avoiding a discussion of the conflict. You are not a person in the eyes of a narcissist; you are an object, and you must surrender your subjectivity in order to be included in the narcissist’s world. One of my narcissistic bosses gave us a container of blueberries shortly after we dissented to her management; they were moldy, and I think she knew this before she gave them to us. A narcissistic teacher I had began bringing in snacks for the whole class after we called him out on his subversive white liberal racism. My father deposited money into my checking account shortly after I began pulling away from him. These kinds of gestures are surface-level niceties that aim to maintain narcissistic supply after threat of wound exposure or interpersonal abandonment. If you display hostility toward the narcissist (even if it’s fully justified anger), then you will probably cause narcissistic injury. The narcissistic is genuinely hurt by negative feedback from others (and especially their suppliers), which is also part of what affects narcissistic rage. An injured narcissist might use their previous acts of goodwill against you if you dare challenge their integrity (“I’ve done so much for you, how dare you think so poorly of me!”). This kind of behavior is intended to return the narcissist’s supplier back into a state of shame for having ever doubted the narcissist, and without enough self-confidence the supplier will probably come crawling back to the narcissist. What are some harms associated with narcissistic abuse? Narcissists use shame as a weapon to subjugate their suppliers into resignation and blind devotion. They are similar to sociopaths in this regard in that both kinds of personalities tend to pay close attention to the vulnerabilities of others so that these vulnerabilities can be used as a weapon to protect the narcissistic/sociopathic ego from attack. Shame is an emotion that regards a perception of inadequacy toward the self in general, which is why it is a useful emotion for narcissists to affect in others so that they can maintain full control over those upon whom they depend for attention. One of my narcissistic exes used to repeatedly bring up my mental health stuggles upon confrontation about his hurtful behaviors by saying “I thought you were more stable than this,” which deeply shamed and humiliated me. I let him know how much this hurt me, and he continued to use this phrase simply because he knew it hurt me and would keep me in check. This is the ex who said he loved me within 24 hours of meeting me, and shared early on that he used to struggle with vanity. Repeated shamings can develop into generalized feelings of worthlessness and a belief that the narcissist knows who you are better than you do. This invasiveness is what erodes the subjectivity of narcissistic suppliers as they begin to feel that they are not allowed to have their own opinions or beliefs because they be shamed for having them. This type of emotional reasoning is what narcissists exploit to maintain their network of subjugated admirers who blindly accept their authority without questioning it. Toxic shaming is not only damaging to personal identity but also functions as a type of gaslighting to get suppliers to second-guess their negative evaluations of the narcissist. This is how toxic shaming gets suppliers to question their sense of reality and depend upon the narcissist for truth. Most narcissistic shame weaponizations are subversive because narcissists care a lot about being well-regarded by others, and therefore do not usually commit overt acts of cruelty because this would make them look bad in the eyes of others. Sadistic narcissists who enjoy hurting others are thus susceptible to social exclusion and vulnerable to narcissistic rage, which is why they seem to be drawn to positions of authority that permit acts of aggression and violence. My brother who used to punch me for stuttering when I was a child is now a very successful deputy sheriff just like my father was. One of the most terrifying sadistic narcissists I’ve met is a tenured faculty member at my university who has been practicing therapy for over 40 years. He teaches summaries of his own articles and his interpretation of the texts he assigns, and hyper-performs the role of therapist in class so that students can imitate him during class exercises. I made the mistake of opening up to him about my past struggles with my sexuality, which he later used against me by having me role play a straight person who had sexual feelings toward the therapist. I was traumatized by this activity and filed a Title IX complaint against him after he screamed at me during office hours for bringing up how hurt I was by this activity. I am still very upset by this experience, and want you to know that one of his most popular webpages is a list of research articles that allegedly prove with empirical evidence that women are just as if not more aggressive than men in intimate partner violence situations. Erasure of subjectivity is another harmful effect of narcissistic abuse that can not only create a pervasive sense of emptiness but can also damage the ability to relate to other people in general. Narcissists are the only people in their world who are allowed to have subjective experiences, which is what makes the world of the narcissist a type of orchestrated projection of the narcissist’s ego. Narcissists need other people to follow their lead without question, and are therefore threatened by subjective experiences that do not affirm their sense of grandiosity. This is why narcisssists do not care much about what other people have to say, and will only attend to others inasmuch as this gets them the attention they desire. Do not be surprised if a narcissist is visibly disinterested in what you have to say and focuses only on talking about themselves; you are, once again, an object in their eyes, and objects do not have subjective experiences. Narcissists will not reciprocate care or attention in any substantial way, which can be especially devastating for children of narcissistic parents who depend on their parents for care and attention. The overall impact of this aspect of abuse can result in a perception of profound worthlessness. “S/he doesn’t listen to me because I am not worth being listened to,” is something that someone experiencing narcissistic abuse might think about themselves, and if this person maintains long-term relationships with narcissists, then this can develop into a more general emptiness that hollows out every aspect of the person’s life. This is the context within which narcissitic abuse can be understood as a type of relational trauma wherein the abused surrender their subjective experiences (and, subsequently, sense of self) in deference to the presumed authority of the narcissist. This can then generalize into a more general pattern of fawning before others to meet their needs in order to continue surrendering oneself out of fear of being punished for or ignored in virtue of having subjective experiences. One of the most fascinating narcissistic behaviors I’ve noticed involves transference of repressed trauma onto accusers upon successful identification and explict articulation of the narcissist’s abusiveness. When confronted with their abusiveness, the narcissist is threatened by a psychic breakdown that can be defended against only by attributing the content of the accusation to the accuser themselves. This is where confronting narcissistic abuse becomes very dangerous if you have not created a sturdy boundary between yourself and the narcissist. The narcissist will first use your vulnerabilities against you, and if you persist then they will attribute to you the issues that they themselves have disavowed. In psychoanalytic terms this is what would be called a reaction-formation: as in, stating the opposite of what is actually true in order to keep the truth repressed and instead externalized onto others. The most common manifestation of this process I’ve encountered has involved narcissists telling me I have issues during a confrontation. I have never denied having issues, and interpret this response as a reaction-formation that helps me know that I am not only dealing with a narcissist but have also been successful in identifying their repressed issues. The moldy blueberry boss exploits our labor to complete her work for her. I confronted her about this via email, and her response involved suggesting that I apply for disability pay if my personal struggles get in the way of my ability to do my work. This response not only ignored the content of my accusation, but appeared to me like a reaction-formation — as in, she (unconsciously) believes she is not well enough to do her job, but has disavowed this truth, and instead projected (i.e., transferred) it onto me because I successfully identified and drew attention to this repressed aspect of her psyche. I remained firm in my response by stating that it was not appropriate to use my personal struggles as leverage against my concerns as her employee; she got in trouble for this response and has avoided me ever since. Younger me would have felt ashamed in response to this attack and believed she was right, but with experience I have learned to stand my ground to protect myself from this kind of abuse without letting the narcissistic mind-game win me over. How can I heal from narcissistic abuse? I’m in the midst of this healing process and thus have less to say about it, but do want to share what has helped so far. Boundaries are essential when dealing with narcissists. Cutting the cord on the relationship is the most efficient way to set a boundary with narcissists, but I understand that this is neither easy nor always possible. You must therefore set boundaries by keeping space within yourself that is not colonized by the narcissist. This is the context out of which you can begin to protect yourself from their behaviors and begin to see where you end and they begin. Be firm in setting your boundaries and do not let the narcissist shame you out of them — it is likely they will try, and you will therefore need to be strong and confident in standing up for yourself. Assert your boundary by explicitly stating your needs and affirming your rights. In order to reduce the chances of affecting narcissistic rage you should preface your boundary-setting with statements about how you know that the narcissist does not mean to hurt you, but that you nevertheless do feel hurt and want them to treat you differently to avoid being hurt again. Stick to “I feel…” more than “You make me feel…” statements because these latter statements will probably affect defensiveness that will likely shift into a shame-guilt-blame festival. You can (and should) walk away from the conversation if it starts to go in this direction, and have a right to let the narcissist know that this is what you are going to do if the conversation continues proceeding in this way. Use material consequences to leverage narcissistic behavioral change. Narcissists have no internal mechanisms to connect their actions with wrongdoing, and must therefore be met with tangible consequences in order to affect change. This is how you can get the narcissist to care about modifying their behavior. To do this, think about what the narcissist gets from you, and use that as leverage when describing what you will do if they do not start to act differently. Lastly, try to think of the narcissist as a wounded child because that is ultimately what they are. Framing narcissism in relation to coping from early childhood abuse and neglect creates room for compassion toward the narcissist that can be used to mitigate the pain associated with narcissistic abuse. Do not forfeit yourself to this compassion, however; you need to care more about yourself than the narcissist, and this does not make you unhealthily narcissistic! You have a right to healthy and uplifting relationships, and chances are that if you are with a narcissist then it is likely that the relationship is neither healthy nor uplifting. critical queer student of philosophy and psychology // occasional scandal // recovering puritan // serious joke // etc.